"In an age of swords and sorcery, one young hero holds the key to infinite wisdom--and ultimate power." Not any sorcery, actually. Somewhere in the medieval nation of Europe, a young boy is sold as a slave but bought/rescued by "Baydool," who works for the "Delta Knights," against the villainous "Vultare," who works for "The Mannerjay." They're trying to find the lost treasure of Archimedes, Leonardo da Vinci is with them--if you try to make sense of when or where this film happened you'll go crazy. Roll for initiative! This is an underrated episode I think. The movie's got a crazy premise, the settings seem like they came from a LARP, and it just opens itself to riffing, which is nice after a couple of numbing episodes. Host segments are also great, with the "Loaner AMC Crow," another of Servo's chorus performances, and Pearl doing the riffing for the first quarter of the episode. 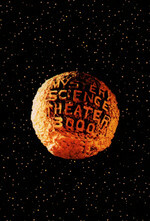 This is the end of Season Nine of Mystery Science Theater 3000. Assembled people and robots, we have entered the home stretch. YouTube (1h32m) Premiered September 26, 1998. 13 episodes left. The pancake breakfast scene involved the most extras ever in any of our sketches, and word of that fact had apparently leaked out before the show's airing. We certainly hope no one expected a chariot race or a reenactment of the Battle of Shiloh or something along those lines. Hey, this was hard enough. We're all pretty gun-shy about hail damage here at Best Brains. Most of our cars were destroyed by hail back in May, and I'm still dickering with the insurance company over damages to my house. They're threatening to just total it out and give me the Blue Book value, which means I'll be living in an '89 Toyota before long. "A secret society, the Delta Knights, attempts to save a medieval society from the evil over-lady." Directed by James Dodson. Written by Redge Mahaffey. Starring David Warner (two roles and narrator), Corbin Allred and David Kriegel. I think this episode is underrated because the movie itself doesn't take itself overly seriously. I say, there's a difference between having fun with itself and letting its brains fall out its ear, and this movie definitely crosses over it (on the brains-falling-out side, that is to say). One character is called "The Mannerjay." A quick Google search suggests there is no such thing. Indeed, in a show that's given us characters names things like Dropo, Torgo and Zap Rowsdower, I think this one wins the dubious prize for the silliest names of all. Baydool! Wamthool! Jaamteer! Madam Maaydeed! Fantle! Anreonne! This is another quick-to-show episode, first aired in 1993 and riffed in 1998, after just five years. The turnaround was so fast that, when the movie hit video (it was never in theaters), the show was nearing the end of the Joel era. My guess is that they were desperate to make a buck after releasing it. This is another of those few remaining episodes that, due to rights issues, will probably never appear on DVD. My guess this time is that, after getting their movie on the Sci-Fi Channel in this way, they figured, to hell with profit, they can get their filthy hands off their baby. Or maybe that they'd rather settle for an incredibly slow trickle of sales of their own rather than a portion of a release as part of a much-enthused-about show. This episode strikes me as kind of like a very slightly more grounded version of Wizards of the Lost Kingdom, from Season 11. I just re-watched this last week and I gotta say, I kind of agree with Mighty Jack. Not so much about Pearl's theater bits—the vibe was different, yes, but not weak IMO. Just the writing of the riffs in general. One almost perceives a little end-of-season burnout. I'd still call this a must-see installment, though, for a few standout moments from the Brains and the overall batshit nature of the film. Which just makes this film's attempts at humor that much more sad. At least Drunkard Fake-Dad from Wizards I was consistently written, tone-wise. Here, you sense that someone in the editing room decided to add humor, perhaps out of a desire to ease off on the sincerity. An understandable impulse, but executed in a profoundly clumsy, limp, and depressing way. Oh, David Warner, I really hope you never saw the finished product. And another thing about that: anybody else suspect that Jumpjuggs's henchperson who keeps screaming "I'M COMEEEEEEENG" is an inside joke from somebody's D&D campaign? Added, again, in post-production, unadvisedly? I too think this is an underrated episode. Maybe I'm just overly fond of the "Touched down in the land of the delta kniiights" riff which is stuck in my brain 50% of the time. I like David Warner, but the man's gotta eat. Sometimes he gets to be in Titanic, sometimes he's in Quest of the Delta Knights. Indeed, in a show that's given us characters names things like Dropo, Torgo and Zap Rowsdower, I think this one wins the dubious prize for the silliest names of all. Baydool! Wamthool! Jaamteer! Madam Maaydeed! Fantle! Anreonne! Ack, forgot the show notification! We had a much longer MST Club than usual tonight, in addition to the before movies, we watched another episode after the end! And oneswellfoop even found the pilot of the failed Carlton the Doorman animated series and we watched that! It was a long and fun but somewhat draining evening. Come by next week and we'll do it again, starting off the last classic season of MST3K, 1001 SOULTAKER, which contains guest appearances by Frank and Joel!